This interview took place on: 1/4/00. Jesus freak Hideout: What's the story behind the name "Beanbag"? Hunz Van Vliet: Our old drummer, Murray thought of the name and it stuck. Funny though, he left soon after we took on the name. Hunz: Much like bands these days-- in your friend's backyard. Michael (guitarist) started the band with Murray (ex-drummer) just as something to do. When Hirvy (bass player) joined and me, Hunz (singer) it then became beanbag. 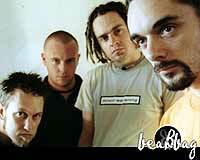 When Phil (drummer) joined we then started getting very serious. We focused on the things that mattered and have tried, although far from perfect humans, to follow God's perfect will. Hunz: It's a mixture of all our likes in music. Overall, it's groove-based with whatever we feel fits over the top. Hunz: *grin* Heaps! 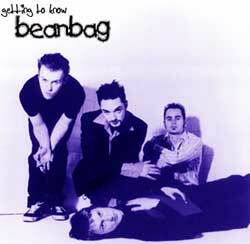 Every member in beanbag has their own sound that they bring to the band. I listen too a lot of Tori Amos, Fiona Apple, Trent Reznor (NIN), Seal, Underworld, DJ Sasha and everything electronic at the moment. JFH: What would you say the overall theme for your new album, Free Signal? Hunz: Free Signal is all about God's will for Christian life. We tried to create a society of characters with the album artwork that had antennas on their heads. These people represent "Christians" in life. When the lighting bolt comes along and strikes them it's like God's will being revealed in your life. That's why the guy in the inside page is happy to be struck by lighting. The cover then tells a quick story of a kid, who is not a Christian dragging a TV, which is false prophet. The 2 people in the background have set their eyes on God and not on the devices of man. While the Guy in the foreground has found his false comfort in the parade of distractions. JFH: How did you manage to get such an opportunity as to be on Peter Furler's (Newsboys) new record label INPop? Hunz: God's been looking after us. We've put a lot of time and effort into this band and God just turned around and seem to point us to the right people. Thanks go to Dale Bray and Michael (guitarist) for their time and effort and, more often then it should have been, sacrifice for this band. JFH: What is the song "Happy Dispatch" about? Hunz: The theme of the song is about all those people that suffer and die in the world because of things that are out of their control but the focus is on the people who have everything but choose to do nothing. It makes me sad that people can get caught up in their life but I must admit that I'm the same. I guess I wrote this to kick myself in the guts and maybe it won't fall on deaf ears. JFH: "Stale" is an interesting song musically and lyrically. Can you tell us a little about the story behind the song? Hunz: "Stale" is one of my favorite songs, lyrically. It addresses the issue of laziness. I remember reading Genesis and those words "created" just jumped around in my head. I never understood why anyone could be lazy when God created us with his own hands. He spent time crafting you. It's amazing. I'm reading the last verse [of the song] now. For those that don't know the last verse, it is about a Christian that compromises himself during the week and then tidies up his life on the weekend. You know, I write the lyrics but I must say I don't think it's me, it's God. I look back on the last few days and I just want too cry, I've been so much like this person that I talk about in this verse. Makes me so sad, I've been created but then sometimes the value of acceptance blinds me and I loose focus on God. Thanks so much for asking this question! God bless. JFH: What is "Obliviant" about? Hunz: Making wrong choices based on peer pressure. You know, you're around friends that are into drugs or alchohol or any device man has made to forget the guilt of sin and they've been telling you how sweet it all is and you then try it. The verses are about the effects drugs, and the like, have on you. Not as dramatic as I would have liked but still confusing enough to tell you that you don't need to experience what man has to offer. The verse is just me being frustrated at people that make choices under peer pressure. Please always allow God to be a part of your choices in life! JFH: What is favorite Beanbag song? Hunz: "Face I Paint" is mine, it's such a personal song. It's about bad habits becoming so big that they steal your time from God. It wasn't until it had built up so much that I understood that I can't remove sin from my life only God can. He accepts my sin and all and we work things out together now. I'm also not saying that it's never going to happen again because it may, that's the human condition, but I pray that I learn from my mistakes. JFH: What does the future hold in store for Beanbag? Hunz: I honestly don't know. I'm just finding it hard enough to be human at the moment. Because of the condition of sin there are things in my life that have happened that I have to deal with (with GOD'S amazing help though). I pray we do everything God intends us to do and that we are always honest no matter how hard it may be. JFH: What are your thoughts on the new millennium? Hunz: I haven't thought about it too much. I loved the hype about the Y2K bug, I don't know if I actually thought much would happen but I loved to talk about it just the same. Sorry to those that might have been freaked out by it. Focus on God though and not yourself. Everything these days is about doing what YOU feel is right. If that was the case I would have been dead ages ago, I would have FELT it right to give myself away to the world. Everything in life is about GOD and the BIBLE, nothing more, nothing less. He is the answer. Hunz: Awesome that you guys are doing this! I listen to little Christian music for the reasons that you just suggested. It's always seemed dated, trapped in the 80's but recently everything is almost surpassing the secular scene which is awesome. I listen to Battered Fish, Dumpster, Tonjip, The Frugals, Elementary Penguin and a few other Australian bands. Recently I had the joy of hearing Nichole Nordeman, just so amazing and honest . . I have never listen to much American music, sorry about that. Hunz: Thanks for the interview. It's not often you get an interview that actually convicts you to change because you've slipped into stupid habits. I'd say it's timed by MR.GOD Himself! THANK YOU! God Bless everything you do and if anyone gets a chance as I have, please read C.S. Lewis he is just great. Oh and sorry about the grammatical and spelling errors I haven't been blessed with those skills . . woops!